THE JEFFERSON AIRPLANE - FRIDAY MUSIC 180 GRAM AUDIOPHILE SERIES CONTINUES!!! “SOMEBODY TO LOVE AND WHITE RABBIT, THOSE TWO SONGS ARE WHY WE ARE IN THE ROCK AND ROLL HALL OF FAME.” JORMA KAUKONEN"
1967 was an amazing year for rock music, and San Francisco was the place to be for legendary classic rock bands like Jefferson Airplane. 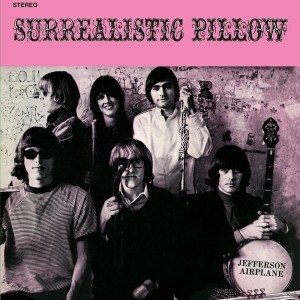 After their gold Lp debut "Takes Off", Jefferson Airplane changed line-ups with the addition of future superstar lead vocalist Grace Slick and jazz/rock drummer Spencer Dryden and delivered the monumental classic "Surrealistic Pillow." Along with founders Paul Kantner, Marty Balin, Jorma Kaukonen, Jack Casady and their musical and spiritual advisor Jerry Garcia, "Surrealistic Pillow" would become one of the most important albums of all time, as well as defining the "Summer Of Love." With a groundswell of support from the hip record buying public to major airplay at both underground FM and pop radio stations, the Lp was received incredibly well. Featuring two smash singles with "Somebody To Love" and "White Rabbit", both tunes would go on to become rock music and social anthems for the turbulent 60’s. Even more stellar album tracks like "She Has Funny Cars", "3/5 Of A Mile In Ten Seconds" and "Plastic Fantastic Lover" would all become standard Airplane classics in the years to follow. “Jam bands” began with groups like Jefferson Airplane. Therefore it’s no surprise to hear the wonderful workouts by dual guitarists Jorma Kaukonen and Paul Kantner along with Grace Slick and Marty Balin power vocals and Spencer Drydens’ unique drum work, rounded out with Jack Casady's stunning bass riffs on this watershed release. Friday Music is honored to present another exciting installment in our Jefferson Airplane 180 Gram Audiophile Vinyl Series with their masterpiece Surrealistic Pillow Lp, now pressed on stellar Black, White & Gray Swirl Vinyl. Mastered impeccably by Joe Reagoso (Jefferson Airplane/Hot Tuna/Grateful Dead), this first time 180 Gram Black, White & Gray Swirl audiophile vinyl release will become one of the more important albums to grace your collection this year in celebrating 5 Decades of this album as well as their important appearance at Woodstock in 1969. To enhance your Airplane listening experience, we are including a striking gatefold cover art presentation, featuring informative liner notes from Jorma Kaukonen and Jack Casady, making this an even more rewarding event for the "White Rabbit" in all of us.